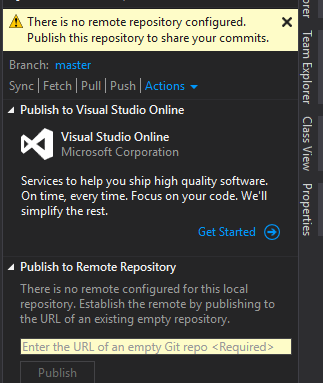 Today I’m sharing for my own memory banks how to add a new Visual Studio solution/project to Git source control. If you’ve heard of Git, you’ve probably heard of Github, which hosts roughly a zillion git repositories. One problem with Github (at least as of now) is that they don’t offer private repositories for free, only public ones. If you don’t want to pay for your little side projects to be hosted in a private repository, what is a poor dev to do? Simple, use Bitbucket instead. 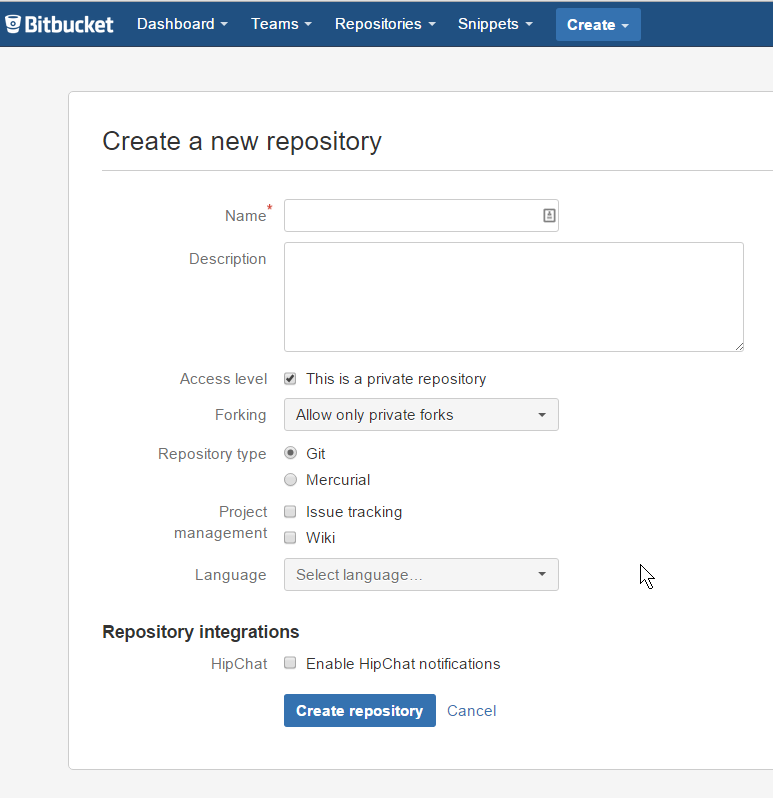 With Bitbucket you can host private repositories with a free account. 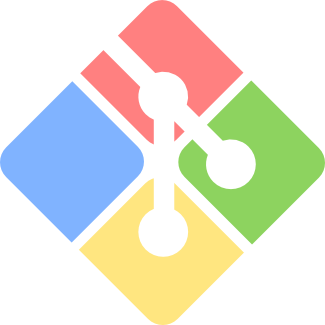 So how do we host our git repository on Bitbucket for free? I’m glad I asked, so for me here are the steps (with too many missing screenshots, because I forgot to take them). Enter the repository details and click Create repository. Back in Visual Studio, right-click on your solution and select Add solution to source control. In the window that pops up, select Git. In the Team Explorer window that comes up enter in an initial commit message. On the button below it, select Commit and Push. You’re done. (Had to make it a nice even 10 steps). Now, if you check in Bitbucket, you’ll see the source control is now in the repository. A big thanks to my past self for writing this up from my future self (now present self). When we have long lists of items, it’s nice to present the users with the option to page them, instead of showing them all at once. You can use your standard pager, which works great with something like a table list, or you might be able to try something called “infinite scrolling”. Infinite scrolling is that feature where you start scrolling to the bottom of the page and it automagically loads more data for you. So, it’s like paging but using the browser scroll bar. I’ve been doing a redesign of a book listing site, and instead of just providing the standard pager, I thought it would be nice to let them just keep on going. …You can see jscroll there at the bottom. Now, if you happen to be using the “Main-Bower-Files” NodeJS package I wrote about before, you’ll just need to open up Task Runner Explorer and run the Copy command to add it to your local ‘wwwroot/lib’ directory. If not, then you’ll need to modify your gulp.js file to tell it to copy over the new file to your ‘wwwroot/lib’ directory. …This scripts section adds the JScroll library and initializes it. In this example, it will just look for a tag with the id of booklist. I’ll show you that in a minute. The other properties turn on its debugging and changes it’s loadingHtml to show a loader image (from the MaterialCSS library). Now, let’s create a partial view. So, create a new view under your Views and “ControllerName” directory (Views/Books, for example) and name it “_BookList”. The underscore is not necessary, it’s just convention. …So, it will simply add another UL list on each call. The link is what JScroll calls to show the next set. It will keep calling until we do a return of EmptyResult from our controller, which will then not display any HTML and JScroll will see that as a call to end. The ViewBag.Page just keeps track of what page we’re on and what to fetch next. …You can see this method is called by the ‘booklist’ route and accepts one parameter called ‘page’. The first thing we do is call our list of books from our EF context. After doing some initializing, we next do some checks on what range to display. Our first check is to see if given the pagenumber * the pageSize will go beyond the number of books available. If so, then we’ve reached the end and return an EmptyResult. The next if-else check will see if we have a full set of pageSize to display or just whatever is left. We then grab that range from the list. Finally we update the ViewBag.Page count and display the partial view. If you look at your browser’s console, you’ll see it’s giving an error that it can’t load them. When you go directly to the CSS file, IIS throws up a 404.8 Hidden Namespace error. It’s not a 404.0 Not Found error, because it sees the files, it just can’t load them. 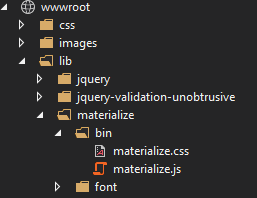 If you look at the name of the directory that the Materialize team chose to use - ‘bin’ that might give you the clue to why this is happening. To protect us from possible attacks, by default certain key directories are blocked, including any directory named ‘bin’. Now, you could add code to remove it from blocking bin, but I just found it safer to move the files outside of the ‘bin’ directory. That will copy the files from the ‘dist’ folder instead of what is defined under ‘main’. You can read up on 404.8 IIS errors at your leisure. In Part 1 of this 2 part post we looked at how to use Bower to bring down a new client side library. In Part 2 we will focus on how to include the important bits of that library in your ASP.NET 5 web project using Gulp. This tells Gulp to perform a function when you call ‘copy’ or ‘clean’. So, this is the second piece to the puzzle of adding a client side library to your project. 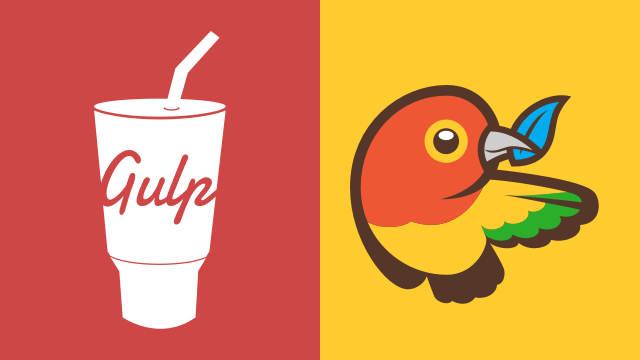 Bower let us bring down the package and Gulp will copy over the appropriate bits into your project. We could simply add a line to the bower variable in the gulp copy/clean function defined above that will copy over the ‘dist’ folder contents from our materialize library. That will work just fine. Problem though is that for every library you want to add, you’ll need to remember to add it to ‘bower.json’ and ‘gulpfile.json’. I hate having to do similar things in two different places every time. To get around this enter a nice Node.js package called “Main-Bower-Files” from Christopher Knötschke.